The Mantis shrimp is frequently considered an aquarium pest, as they are frequent hitchhikers on live rock and will kill aquarium stock. They are becoming increasingly popular as a Saltwater pet and keeping a mantis is one of the cheapest types of saltwater aquariums. Mantis shrimp are carnivorous. This shrimp is a smasher and will eat small hermit crabs and snails. Smashers may eat fish, but normally not if food is plentiful. If the Mantis shrimp refuses to eat frozen foods, then do not feed it for up to two weeks. Everyday stick the food (On a stick or skewer) into the tank and swish it in front of the shrimp and wave it outside its burrow, or even prod it with the food lightly. If after two weeks it will still not eat, put in some food it will eat, such as crabs and snails. Smasher type mantis shrimp need a little bit of hard shelled food to keep their raptorial appendages (smashing claws) in shape. 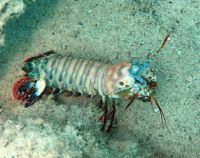 This is especially important to the survival of Odontactylus Scyllarus, the peacock mantis shrimp, because it is prone to shell disease and moulting problems. This animal required calcium to facilitate moulting. It also needs a burrow. An appropriately sized live rock will work for smashers (it will make a hole if there is not one available) or a PVC pipe about 1.5X the width of the mantis. Smaller smashers can house in large shells. Odontactylus scyllarus can't stand strong lights as it will cause shell rot and moulting problems. It also requires good flow to prevent shell disease and preferably a protein skimmer. Smashers that live above 10 meters deep can stand full strength light. Also smashers larger than 15.2cm (6") can break aquarium glass, though it is unlikely unless it is taunted. It may break it digging, though, which is why a large smasher should be housed in an acrylic aquarium, or have acrylic put under the substrate and some acrylic strips in the corners. Only one Mantis Shrimp should be kept in a tank. It will fight with and sometimes kill members of its own species and many other livestock. In much larger tanks, two mantises may be kept together and some spearers will mate for life. Some urchins and sea stars can be kept with caution also. It depends on the mantis's personality. You should not depend on the store's classification. It is necessary to identify it yourself. A useful link for this is Dr. Roy's list which helps you identify most mantises commonly sold in aquariums. The first step in identifying a mantis is to figure out if it is a smasher or spearer. Smashers smash their prey, and spearers will spear soft bodied prey. If you hear a clicking noise, it is probably a smasher. If you notice fish missing, it is probably a spearer. Next is its size, colour, and then, if you know, where it came from. Dr. Roy's list is in external links. This page was last edited on 24 October 2016, at 07:28.